One of the central questions facing Buddhist communities is the issue of how traditional Asian patterns of authority may need to be transformed in the American context. In most Buddhist communities, the traditional roles of monks are of necessity changing. As one monk in Phoenix put it, “We have to take the plant of Buddhism out of its Asian pot and plant it in the soil of America.” And the soil of America is filled with strong nutrients of independence and democracy. Many Asian immigrant temples have one or more resident monks, but the traditional role of the monk has been called into question in the American context. How can a monk go on begging rounds in an American neighborhood? Can monks loosen the rules regarding the donning of robes and wear warmer clothing? Can monks drive cars? Can monks carry money and go shopping? Can monks hold jobs outside the temple? These questions challenge the traditional way of life of monks in most Asian societies. Some of the older members of the community look disapprovingly when monks drive to a meeting or take classes at the community college. The role of the laity has also been changing in many temples. Some immigrant monks, for example, may not be equipped to handle the specifically American aspects of temple administration. In American cities and towns, a temple typically may deal with the city council, the planning commission, and the zoning board. In the U.S. context, religious bodies are nonprofit corporations and must follow rules set down by the Internal Revenue Service. They must have directors and officers, a group of persons which may or may not include the monks. Thus, lay leadership has grown of necessity. The relation of a board of directors, which has legal responsibility and authority to make all decisions, to the monks, who traditionally have held unquestioned authority, has often been complex and even strained. Of course, American convert Buddhist centers also have boards of directors and the impetus of American democratic ideals. In a typical Zen center, for instance, while the resident abbot or roshi may have the spiritual authority of enlightenment, laypeople with ordinary insight are active and sometimes critical voting members of the board. Questioning the judgment of the revered teacher from Japan or of that teacher’s American-born dharma heir may be difficult, but it happens. Holding the teacher to accountability may become the burden of the board and the center members. For example, the San Francisco Zen Center, after a scandal involving Suzuki-roshi’s dharma heir Richard Baker-roshi, decided to elect its two abbots to four-year terms. The idea of electing an abbot is, no doubt, a distinctively American innovation in a centuries-long pattern of religious authority. 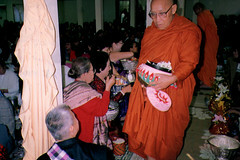 In American convert communities with Theravada roots, such as the Vipassana tradition, there has been a marked shift away from ordination and monasticism of any kind, though Asian monks are welcome and frequent visitors in American Vipassana centers. The impracticability of full Buddhist monasticism in the U.S. context has led to a new style of fully committed lay leadership. There are no trappings of authority at all: no robes, no special garments, even for the most revered of teachers. The most prominent American teachers of the Vipassana tradition are non-ordained and stress the integration of Buddhist life with daily life, not its separation. 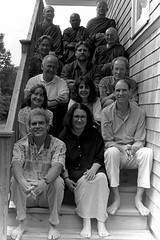 They may be full-time resident and guiding teachers of major institutions, such as Joseph Goldstein and Sharon Salzberg at the Insight Meditation Society, or they may combine their Buddhist teaching vocation with professional work as psychotherapists or doctors, such as Jack Kornfield and Sylvia Boorstein at Spirit Rock Center north of San Francisco. Asian Buddhist traditions, now firmly planted in American soil, continue to grow. There is no question that the democratization of Buddhism is one of the distinctively American developments of the tradition.